Bring your WHOLE self to Work? Shrek and Donkey live in my brain. My three-year-old daughter’s favorite game is to pretend she is Princess Fiona. She trots out the plush Donkey, Dragon and “Puss N’ Boots” dolls, but the Shrek doll always stays in the toybox. “Daddy, YOU be Shrek!” she says. And so it is, nearly every day. 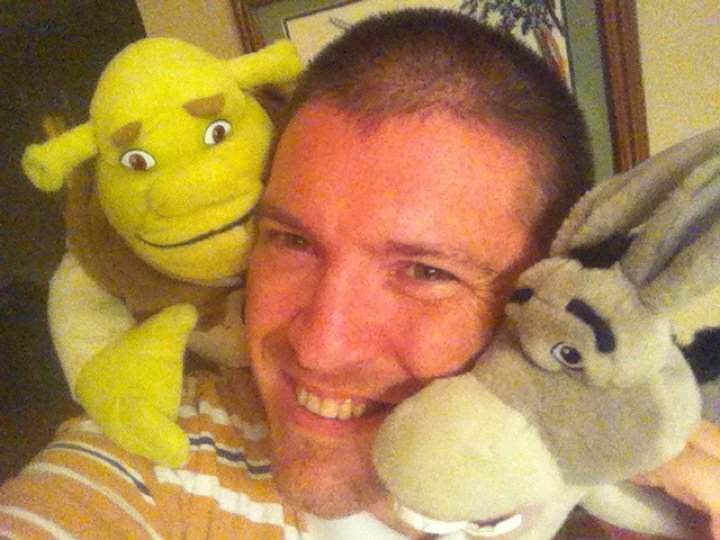 So when I found myself at LavaCon 2010, naturally Shrek and Donkey were right there with me. They simply LOVED the conference. Shrek appreciated the focused approach of speakers from 4Js Group and Cloudspark Communications. Donkey absolutely OWNED the LavaKaraoke and is STILL talking about the “Make-Your-Own” Parfait bar! So many of us have more than one side. And for so long, we’ve kept our “fun” side locked away, tidy and out of sight while we’re at work. It wasn’t “safe, sane or appropriate” to bring our entire selves with us to the office. Or so we thought. Social Media has changed things. With the rise of social sharing, we’ve seen a new emphasis on authenticity. Business as usual has become somewhat dry. Can “corporate speak truly build an engaged social community?” Can formality drive passionate brand advocacy? I would say it seems increasingly unlikely. So what are we to do? Well, it’s somewhat risky, but I’ve elected to bring my WHOLE self to work. See I’ve worked for years as a business analyst and operations manager, emphasizing the task-oriented side of my brain and personality. But I spent years before that in show business, making people laugh and smile. For some reason, I thought “smiley guy” had no place in corporate America. Social Media has proved me wrong. What about you? What parts of your heart, history and personality could bring joy, hope and optimism to your work place? In a era of longer hours and challenging economics, won’t our co-workers benefit from a levity and encouragement? Is it a risk, or a transition? What would YOU think of bringing YOUR WHOLE SELF to work? True, up to a point. As I build a personal brand using platforms like public speaking and social media, I’m happy to reveal glimpses of my personality. You probably have a pretty good idea of what I consider funny, and you know something about my tastes in sports and popular culture. But I draw a line, and I try hard not to cross it. You almost certainly don’t know what I think about the major religious and political issues of the day because I choose not to reveal those things. There are two reasons. First, it’s wouldn’t go over well with the employer under whose banner I blog. Second, why risk offending someone with whom I want to have a professional relationship? I love the Shrek and Donkey thing. And I love the colorful energy that so many of my colleagues bring to our virtual workplace. So I’d say to everyone: Don’t bring your WHOLE self. But please do bring a lot of yourself. Perfect! Just the kind of dialog I had hoped for Larry. You’re entirely right about discretion and the line. There is no substitute for good judgement. I too am careful to bring only honor to my employer (even though this is a personal, rather than a corporate, blog). For me, bringing MY whole self to work means I’ve owned my inner “Mork-ness,” rather than pretending to be the Fonz. It think it means something different for each of us. Love this discussion. Thank you! I agree with Larry. Bringing some aspects of yourself into the fray does engender battles and you have to stifle some of those things that you might consider fun outside the workplace. However, levity in the workplace is necessary (even the virtual workplace) and it makes sense to take the serious straight-jacket and leave it in the cell with Jack Napier. Awesome, Julio! It’s my take that fun at another’s expense is no fun for anyone. The only exception is when the humorists are poking fun at themselves. I believe in temperance. Watching the web, I’m betting that basic humanity will play a larger role in 21st century business than in the past two. It should be a blast! A brave post filled with your normal hope and optomisim. Bravo! One does wonder if the only “non-work” aspets of personality are sense of humor and political views? I’m fortunate in that as a contractor I have a little more freedom of expression. I pride myself on bringing my honesty and critical judgement aspects to work. Not being worried about the next eval or the politics of most situations, I strive to give my client my best efforts and clearest messages. The newer collab style that we are moving toward has a lot of advantages. Let’s make our workplaces, both virtual and real, a more complete representation of who we really are. A little personailty helps brighten every working moment. Oh I absolutely LOVE your last quote, Ed. I’m going to Tweet it. Indeed, I HAVE to. I must! And KnowledgeBishop — I love your enthusiasm, boundless energy, and playfulness that you bring to the table, ALONG with your professionalism. You had me the moment you sang “with baby jaguar at his side” (GO DIEGO GO!)…. I wish I was at THAT session. Sounds fantastic! Yesterday, Diego rescued the Pygmy Marmoset! That kid always brings HIS whole self to work at the Rescue Center! Thanks once again, Tristan, for inviting a great discussion! I’m reading your post only minutes after hearing that the 21st miner in Chile has been rescued. This amazing story of how technology is helping to save lives and reunite loved ones with their families, seems to meld well with your message. Although I share the concerns expressed here about the importance of carefully considering just how much of oneself to bring to the workplace, I see your message as an opportunity during these challenging times. We’re looking at a world in which we’re rubbing shoulders with colleagues discouraged by long-term unemployment as well as with the “worried working,” who feel pressured to work even harder for fear of losing their jobs. And here’s where I see the opportunity…to do what I can to bring the best of both my character and my skills to my workplace. I don’t have to share my specific political or religious views at work, the more I can strive to bring to my workplace all of the personal values that drive those views — respect for all, fair play, empathy — the better. I can make careful choices about the humor I share at work, but the more I can remember the gifts that smiles and empathetic humor can bring, the better. Your Skrek and Donkey video is a great reminder here! I can be respectful of others’ schedules and priorities, but the more I can remember that everything we do reflects humanity as well as technology, the better. I can be ever mindful of the day-to-day responsibilities of my job, but the stronger vision I can have of my workplace as a professional community of good people, the better. I LOVE your response Lori: What a miracle we are seeing in this rescue. It is a victory for those who choose hope and determination over despair and surrender. I hadn’t heard the term “worried working” but it certainly reflects the climate. It’s refreshing to have such fantastic friends like you who share a desire to inspire! Your impressions are quite amazing, my friend! This is an important issue. I think a lot of people, when they start using Social Media for business, feel like every tweet has to be business related. That’s not really true though. It’s like going to a real cocktail party or a trade show. You don’t just say, “I found this interesting article.” You say, “Hi! I LOVE those shoes!” Well, maybe not exactly that, but…oh heck. Thank much! I do a mean madman too! I think you have super powers. I’ve run into you now at what seems like 73 chat and blogs. No matter where we are, everything you say makes me happy! When I see you, I just KNOW I’m going to like your shoes! Social media has brought out more of my natural personality (although some who know me might say “What personality?”) but there are still aspects of my personal life that I don’t allow to overlap with my professional life. Well Mike, I would say you are rich with personality! Thanks for your input: I think we are all collectively defining the new dividing lines. I do this. I’ve always done this but I’ve changed my temperance of it to different degrees at different times: mostly this was done to please a manager where my behavior may have been deemed inappropriate. I have to tone some things down also because my passion for my ideas often translates into intimidation which is not productive (in most cases). Anger is another thing to watch out for, bringing your whole self to work can make things feel personal when they are not. Rising above this in the moment is key. I do this for a lot of reasons, part of this is two fold: I’m a heretical subversive and my personality bends this way, it is an easy way for me to be… as an introvert this is important for me since social interaction while both enjoyable and beneficial is physically tiring for me. Thinning the layer of censor and defense increases my overall social endurance. The second is that I find it to be a key part of my ability to succeed. When I’m outspoken and honest I achieve better outcomes all around. Yes, this means that I will be wrong and I will fail, this is ok. People forgive this, and they especially back you up when you admit your mistakes! I believe honesty is a key trait to this being successful. If you are deceitful, you may find your whole self not welcome. I believe presentation is too, your whole self will make a greater impact (though mastering this takes a lot of time and practice). If your goal is to lead, it is important to, for example, to know when to have “strong opinions, weakly held” or no one may listen…(http://bobsutton.typepad.com/my_weblog/2006/07/strong_opinions.html – Bob Sutton) And you can be contrary, anti status quo, if your argument is well reasoned and presented well (read: friendly, even if firm or negative); friendly tenacity may be the best position to keep (until presented with compelling evidence otherwise). I’d digress into recent science that shows beliefs are eventually hard wires in the brain which is why they are so hard to change, but you know that instinctively anyway, go ahead and try to flexible about some of yours. This decision: change your mind or stay the course is so often predetermined for us, bringing your partial self is not a real option… you’ll never go a different, scary, new, dangerous, heretical, profitable direction if you don’t. So, bring my whole self? Maybe not, parts of me aren’t so nice all the time, I don’t want those parts to get in the way if I can control them. Bring my whole BEST self to work? Absolutely. I’m not perfect, but I’m worse when I’m trying to be someone I’m not. So I bring my optimist self, I bring my technical self, and I bring my empathetic self… and, I hold little back focusing more on the presentation than the disposition of the content: I say what I believe but I’m very careful of the tone, method and audience I’m speaking to. I absolutely love your response Ryan! Your comment deserves to be it’s own blog post! I can empathize with having to make sure that internal passion isn’t experienced by others as overwhelming or intimidating. I went and did a bit of research on what it means to be a “heretical subversive,” since I hadn’t actually heard these words used as a pair. I wanted to see what we have in common in this area. It turns out, I am not heretical, but I am not orthodox either. I’m “demingesque” or “druckeresque” I guess. I think most things can be MASSIVELY improved if the people involved are willing. I like that you achieve better outcomes through honesty. That’s a fantastic realization for anyone to have. I respect and value friendly tenacity too, and have had to bring that with me my entire career. In summary, I think YOUR summary is perfect: Bring your whole BEST self to work. I love ALL your musings on authenticity but this has to be my favorite to date! As someone who knows you from Social Media, I get to appreciate your wisdom AND your lightheartedness! It’s a great thing. I have been training execs in truth-telling and authenticity for years and it is always refreshing to see how they enjoy finally being able to integrate who they are into what they do! Its fun, engaging, liberating AND productive. It has always been the best choice, but nowadays it is becoming ever more obvious. Thanks for a good laugh and a thougtful take on the subject. Tweet ya around, my friend!